As the sun came up on the first day of the 2015 Volcom Pipe Pro waiting period, it didn’t take long for contest officials to fire off the first announcement of the event. The wind and waves were cooperating nicely and the competition was called on with an 8:00am start. The all-Hawaiian Round of 112 saw nothing but epic Pipeline conditions from start to finish, and the highlight of the day was the Volcom Last Chance Qualifier (VLCQ) heat where 8 Pipe veterans delighted the crowd with mind-blowing Pipe and Backdoor barrels. The Round of 96 started strong, but by the 4th heat the wind changed and conditions quickly deteriorated causing the contest to be put on hold and eventually called off for the day. The Round of 112 was stacked with some of Hawaii’s most exciting Pipeline specialists, and they did not disappoint. Makai McNarmara quickly got things started with a few steep and deep backdoor barrels which certainly got the crowd’s attention. Reef Macintosh threw down the highest total heat score of the round with a total of 14.40. When the Round of 96 got underway, Brazilian Hizunome Bettero showed no fear as he was threading the needle on a gem scoring one of the day’s highest single wave scores, an 8.93. The most exciting heat of the day was definitely the VLCQ in which the one remaining wildcard spot in the event was on the line. The 3rd annual VLCQ was a 40 minute, 8-man heat in which veteran Pipe warriors Bruce Irons, Gavin Beschen, Alex Gray, Kawai Lindo, JD Irons, Kaimana Henry, Derek Ho and Makua Rothman battled it out in a best-wave, winner-take-all barrelfest. All 8 competitors locked into some amazing rides, but in the end it was Bruce’s 9.0 that secured his spot in the upcoming Round of 64. The contest will resume with the 5th heat of the Round of 96, and will continue into the Round of 64 where we’ll get our first look at past champions Kelly Slater and John John Florence. We are excited to see our two event wildcards, Balaram Stack (Long Island, NY) and Parker Coffin (Santa Barbara, CA) hit the water as well. 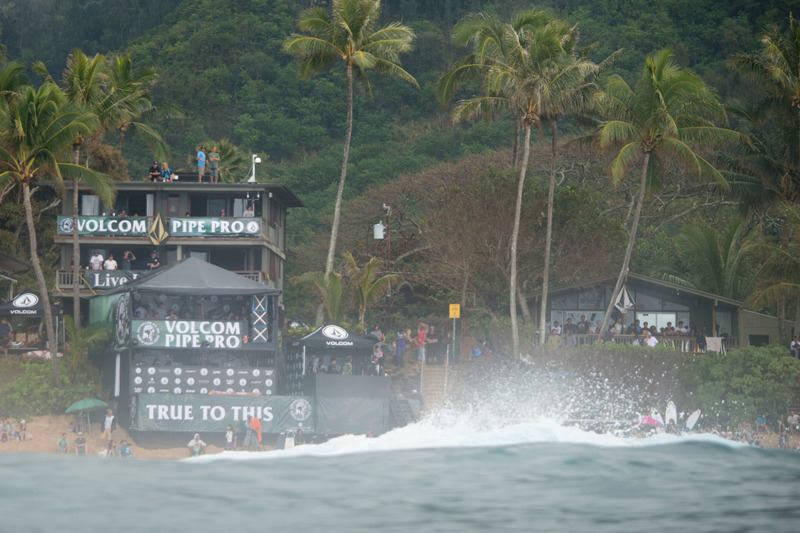 Check back on VolcomPipePro.com tomorrow morning for the next call at 7:30am HST! Be sure to watch today’s Heats On Demand and check out the entire Day One Photo Gallery!